The Caribbean (credit: antiguaspeaks.com)Two thousand and twelve holds both a great deal of uncertainty and cautious optimism for the Caribbean. The election of new governments over the past year in Jamaica and St. Lucia, the controversial re-election of an incumbent in Guyana, and the selection of Michel Martelly out of a flawed election in Haiti has sent mixed signals about the overall direction the region is taking. With the global economy still in an extremely volatile state, the predominately service-oriented economies of the Caribbean remain extremely vulnerable to the action or inaction of Europe and the United States. 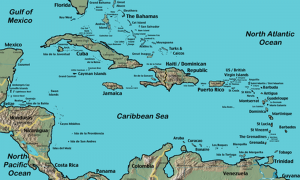 Kevin Edmonds is a new NACLA blogger focusing on the Caribbean. He will be blogging at nacla.org/blog/other-side-paradise. Edmonds is a former NACLA research associate and a current PhD student at the University of Toronto, where he is studying the impact of neoliberalism on the St. Lucian banana trade (where he witnessed much of his family lose their livelihood) and the possibilities of alternative development in the Caribbean. As an active Haiti solidarity activist he has written extensively on the issues of human rights, development, and foreign intervention in Haiti. See also the July/August 2010 NACLA Report, "Fault Lines: Perspectives on Haiti's Earthquake."